An innovative development in hot stamping foil technology offers new decorative finishes for leading packaging material, DuPont Surlyn. 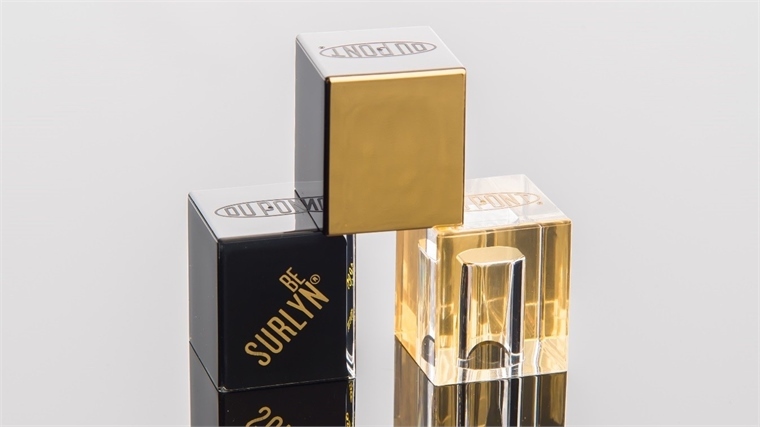 Supplied by American conglomerate DuPont, Surlyn is an ionomer resin boasting lightweight, scratch-, abrasion- and chemical-resistant properties. It is favoured as a reliable and cost-effective packaging choice for food, cosmetics and medical devices. 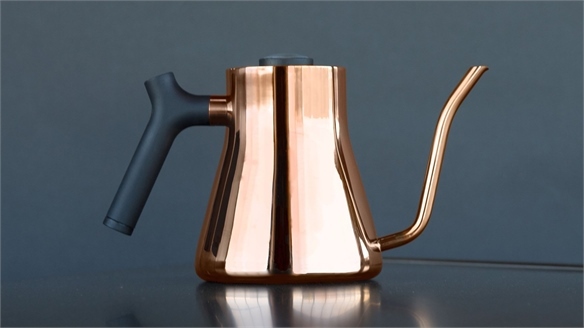 This development by DuPont Performance Materials and German hot stamping specialist KURZ means that coloured, high-gloss and metallic decoration can now be applied to Surlyn surfaces. The creation of a suitable foil was a complex project that took several months of research and testing. Surlyn is already known for its inventive solutions and creative freedom with its broad portfolio of grades, renders and finishes, including transparency, gloss, pigmentation and metallisation. 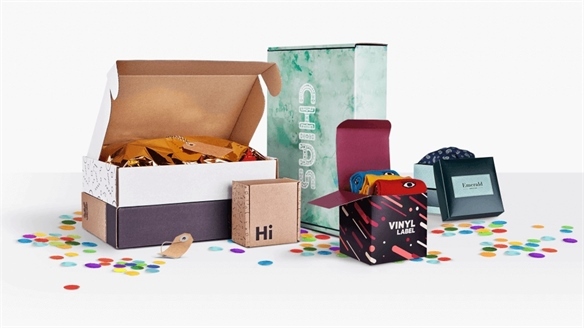 The new effects open up even more exciting design and decoration opportunities, allowing companies and designers to produce luxury packaging solutions with further options for brand personalisation. 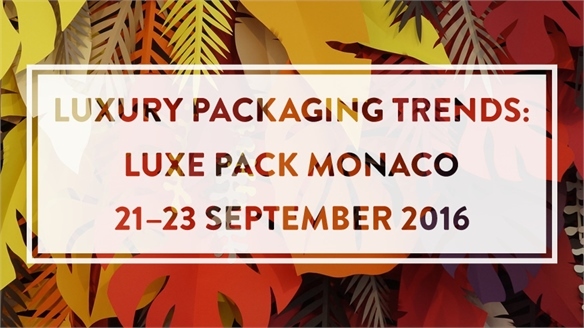 The innovation will be presented at Luxe Pack, Monaco between October 2-4. Look out for more coverage of this event. 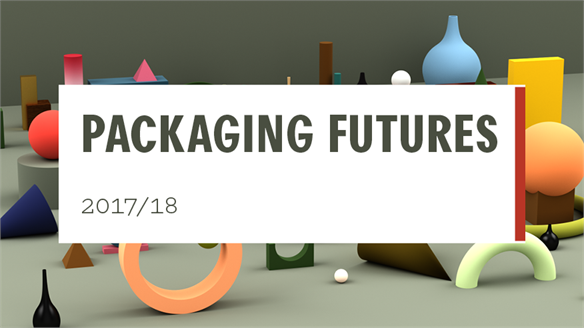 For more innovative packaging solutions, see Packaging Futures 2017/18. 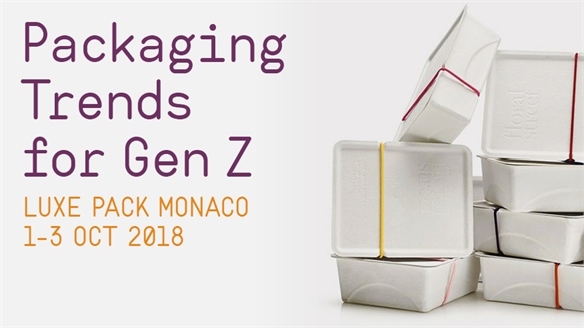 Packaging Trends for Gen Z: Luxe Pack Monaco 2018 Luxe Pack Monaco 2018 This year’s Luxe Pack Monaco marked a clear turning of the tide for the creative packaging industry. Sustainability was baked into the heart of every stand, driven in part by the influence of the growing Gen Z market. We also saw businesses reassess their relationship with technology in a bid to create purpose for new innovations. 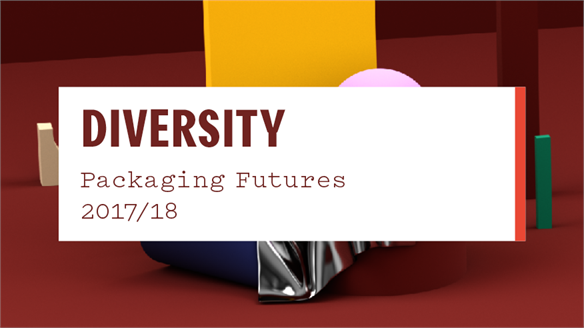 AI-Generated Bespoke Packaging Communicates Rarity AI-Generated Bespoke Packaging As explored in Democratised Design, brands are using the custom capabilities of automated tech to excite consumers by offering insight into a product’s history and conveying a sense of rarity. 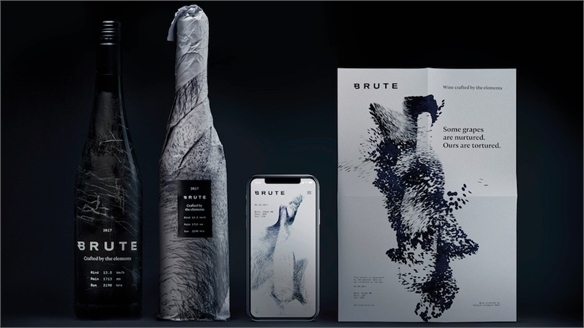 New German wine label Brute illustrates the potential of this technology in packaging, using algorithms to generate bespoke patterns that reflect the unique character of each vineyard. 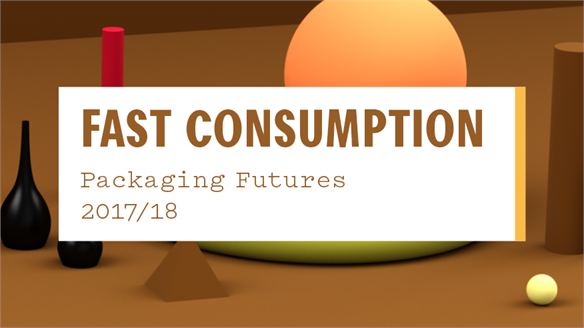 Sensory Signals in Packaging Help Prevent Waste Waste-Reducing Sensory Packaging Consumers’ uncertainty around food and product spoilage is a huge contributing factor to the omnipresent waste problem, with the average UK household throwing away £470 ($597) worth of food annually, according to sustainability experts Wrap. 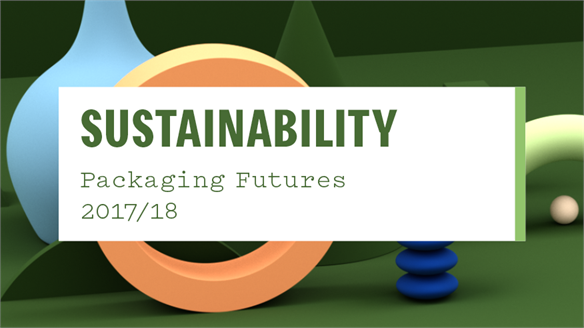 Sensory signals are being incorporated into packaging solutions to aid consumers’ decision-making and reduce product waste. We highlight two innovative new developments. Reimagined Histories: Materials Reimagined Histories: Materials A dark and luxurious aesthetic develops that breathes new life into discarded materials. Historical artefacts are updated with modern processes and time-honoured techniques in order to preserve the past yet appeal to a contemporary market. 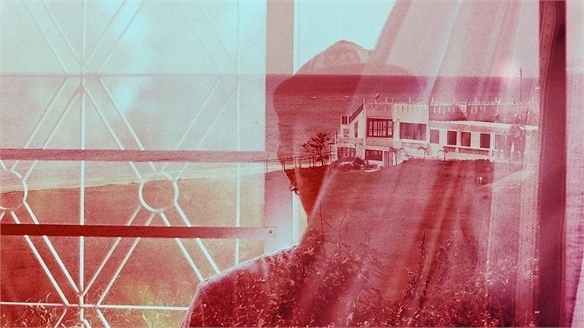 Reimagined Histories appreciates the beauty of aged surfaces and overlooked objects. Everyday waste materials are worked with rich silks, precious stones and opulent metals, elevating their value and extending their lifespan. Aged leathers and complex organic forms contrast against warm velvet, sumptuous fabrics and iridescent surfaces that offer a subtle mystical sheen. 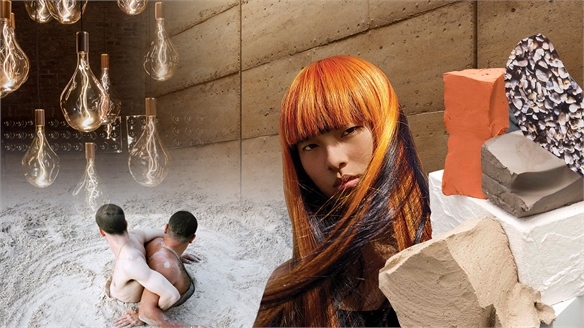 For colour directions relating to this theme, see Reimagined Histories: Colour from our Colour Spectrum A/W 19/20. Colour-Changing Nanopixels Colour-Changing Nanopixels Scientists at the University of Glasgow have developed an innovative high-resolution printing technology that makes it possible to print two different full-colour images in the same space. 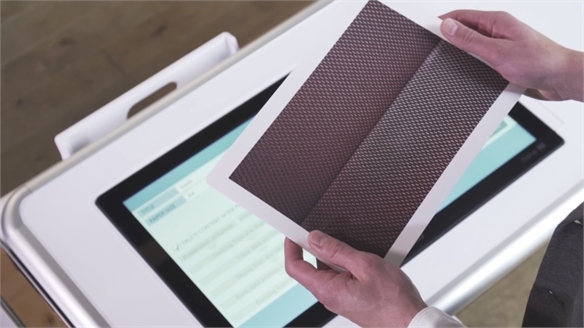 The process uses uniquely structured nanomaterials to render colours instead of relying on dyes and pigments, as in traditional printing. Sacred Earth: Colour Sacred Earth: Colour An inherent respect for natural materials arises as we see the world’s resources diminish. 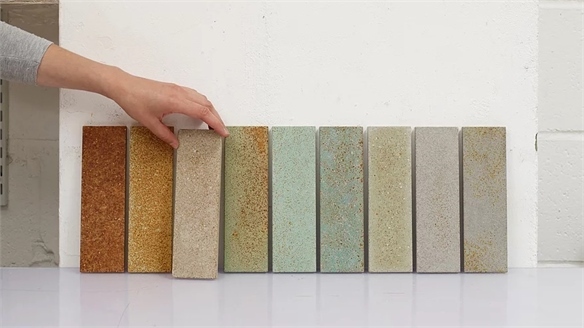 Designers honour commonplace earth materials for their grounding tactile qualities, influencing a refreshingly pure, stripped-back aesthetic that celebrates raw beauty and imperfection. Natural nuances in sand, stone and oxidised metals inspire a colour palette of warm, earthen pigments and chalky tones, with hints of rust red and fiery orange. Textural interest is provided through the contrast of dusty, dry surfaces with polished, glassy finishes. Affogato, Cherrywood and Cocoa Powder offer a trio of rich tonal browns, uplifted by vivid Clay Tile and Apricot Tan. Soothing stone hues Dove Grey and ultra-pale Rosaline complement creamy Warm Light and dark Seal. Aged Bronze adds sophisticated character, while Gold Lamé injects a striking opulent sheen. For materials directions relating to this theme, see Sacred Earth: Materials from our Materials Focus 2019/20. 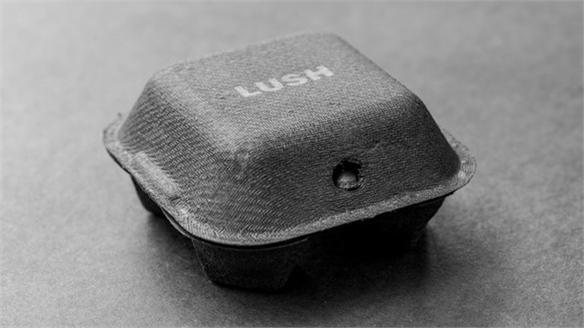 Lush Launches Packaging Made from Recycled Coffee Cups Lush's Coffee Cup Packaging British ethical cosmetics brand Lush has introduced new sustainable packaging made from recycled coffee cups, making use of a prevalent yet underused material source. 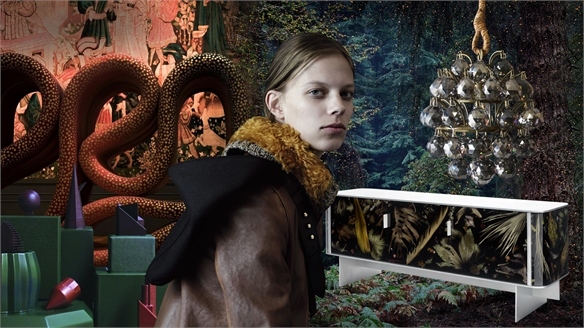 2.5D Casio Printer Mimics Material Textures 2.5D Printer Mimics Textures Casio has developed a 2.5D printer that enables designers to create textured samples that mimic material finishes including leather, embroidered fabric and wood. Comme des Garcons x Andy Warhol: Art-Inspired Fragrance Andy Warhol-Inspired Fragrance Art and fragrance combine for Comme des Garcons Parfum’s latest launch – a reimagining of American artist Andy Warhol’s notorious unisex scent You’re In. 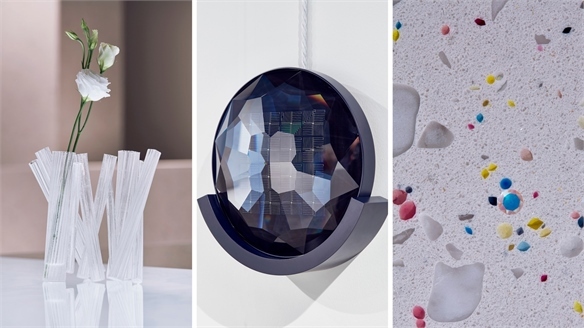 Jesmonite: Material of the Year 2017 Jesmonite: Material of the Year A new annual showcase at London Design Fair called Material of the Year aims to introduce visitors to the most intriguing materials in today’s design world. September’s inaugural event puts Jesmonite in the spotlight. 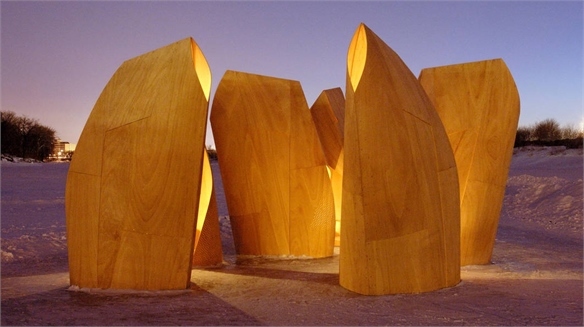 New Exhibition Celebrates History of Plywood New Exhibition Celebrates Plywood The latest exhibition at London’s Victoria & Albert Museum is solely dedicated to plywood. CMF Industry View: Home Appliances CMF Industry View: Home Appliances Our Industry View reports collate the latest trends in colour, material and finish (CMF) and explain how they are set to influence future applications in different sectors, focusing on one industry at a time. 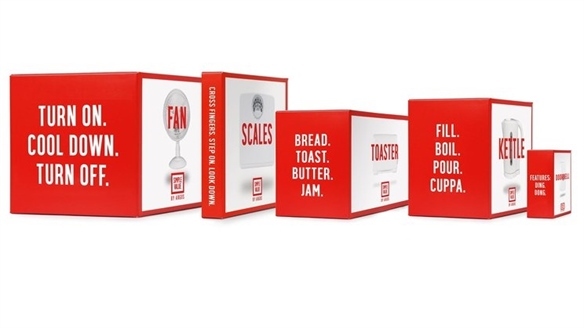 Here, we round up the key themes emerging in home appliances, drawing out inspirational projects from Miele, Smeg and Faber. 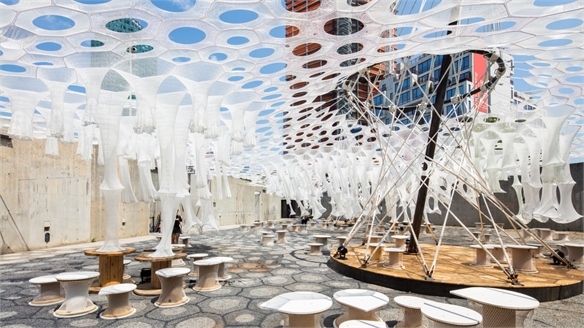 Light-Adaptive ‘Lumen’ Installation Light-Adaptive ‘Lumen’ Installation The Museum of Modern Art in New York is hosting Lumen, an immersive installation made from robotically knitted textiles that adapt to their environment. 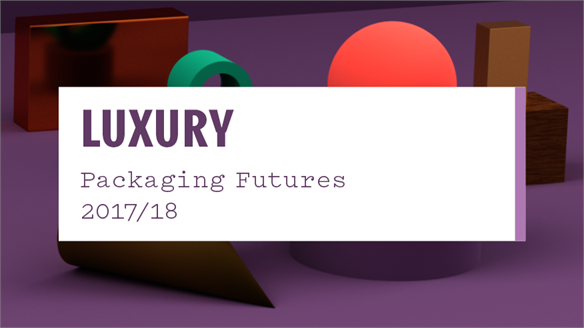 Packaging Futures: Luxury Packaging Futures: Luxury As traditional constructs of luxury evolve, so packaging solutions are following suit, with modified formats that resonate with both established and newly accrued consumer fans. Meanwhile, the gifting experience is being elevated with concepts that encourage connoisseurship culture and ‘long-tail generosity’. 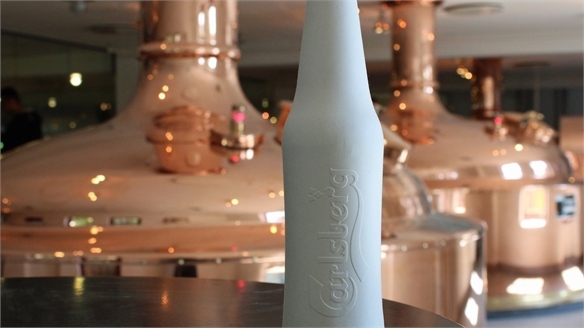 Packaging Futures: Fast Consumption Packaging Futures: Fast Consumption As FMCG brands become more agile – adapting to the changing demands of the time-pressed, on-the-go consumer who still wants to experiment and discover – packaging experiments with contemporary design cues and looks to become an experiential gateway. 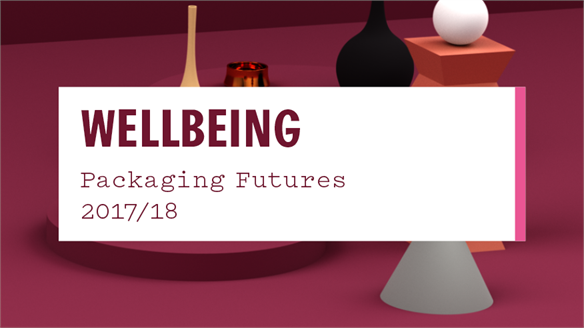 Packaging Futures: Wellbeing Packaging Futures: Wellbeing Ideas of wellbeing are imbued in packaging as brands facilitate meaningful experiences that encourage mindfulness and moments of contemplation. 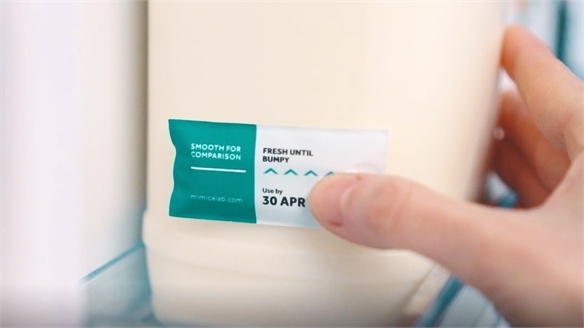 A craving for simplicity and calm sees information translated through a new visual language that focuses on colour and texture, while performance-led packaging focuses on simplifying everyday tasks for peace of mind. 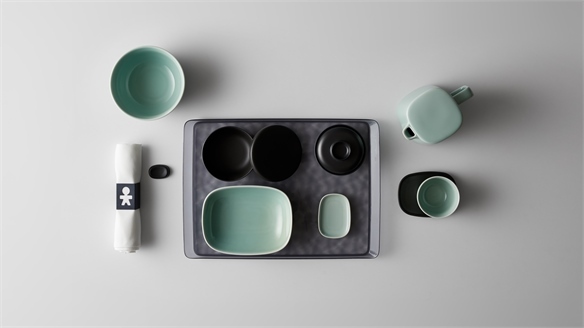 Delta x Alessi: Elevated Airline Tableware Design Delta x Alessi: Airline Tableware US based global airline Delta has worked with high-end Italian design company Alessi to create an 86-piece collection of flatware and cutlery for its premium class cabins. Reinventing Crystal: Swarovski at Design Miami/Basel 2017 Swarovski: Design Miami/Basel 2017 Swarovski’s Designers of the Future Award installation at this year’s Design Miami/Basel (June 13-18 2017) featured the world’s first 3D-printed crystal, pioneering solar-cell technology, and a recycled crystal surface. We take a look at the winning projects. 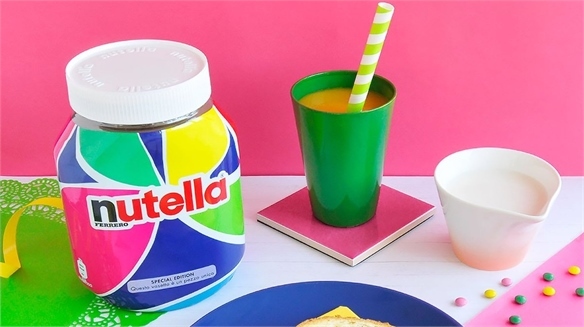 Algorithm-Derived Packaging Algorithm-Derived Packaging Italian chocolate spread brand Nutella has created an algorithm to produce seven million unique packaging designs for its jars, as part of a project called Nutella Unica. 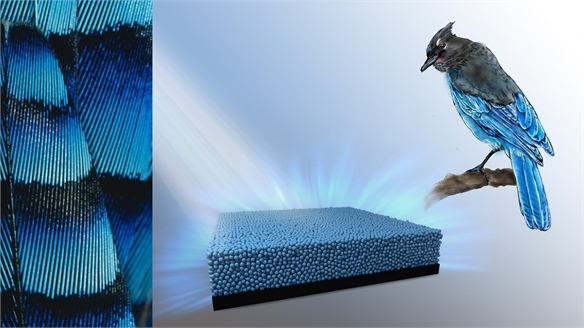 Structural Colour: Bird Feathers Inspire Artificial Pigment Bird Feathers Inspire New Pigment Researchers at Nagoya University in Japan have found a way to replicate the iridescent colour often found on birds' and butterflies' wings. The bright blue wings of the Steller's jay (a bird native to North America) were a particular source of inspiration for the scientists, who were able to reproduce the colour in a lab and synthesise a new kind of artificial pigment. Stationery Trends: NSS 2017 Stationery Trends: NSS 2017 Key trends and highlights from North America's National Stationery Show, a platform focused solely on stationery and paper goods. 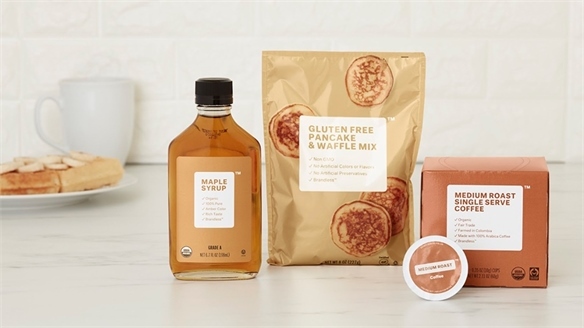 Packaging Trends: Luxe Pack NYC Packaging Trends: Luxe Pack NYC The NYC edition of packaging showcase Luxe Pack (May 10-11) spotlighted the ongoing importance of packaging that aligns with brand values and seduces the senses. 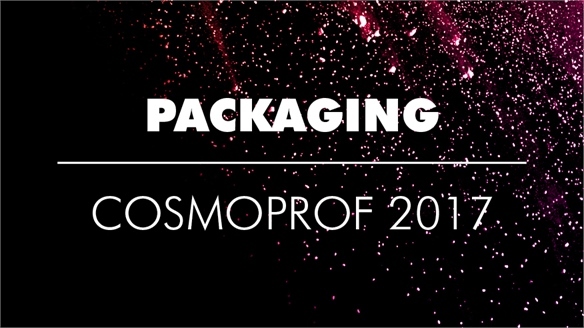 Cosmoprof 2017: Packaging Cosmoprof 2017: Packaging Cosmoprof and its sister show Cosmopack showcased a wealth of packaging inspiration for the beauty industry and beyond. We highlight the noteworthy functional solutions and aesthetic trends from the event. CMF Industry View: Personal Electronics CMF Industry View: Personal Tech Our Industry View reports collate the latest trends in colour, material and finish (CMF) and explain how they are set to influence future applications in different sectors, focusing on one industry at a time. 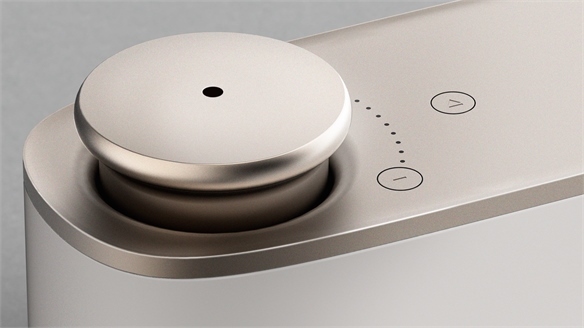 This month, we round up the key themes emerging in personal electronics, drawing out inspirational projects from Nokia, Yves Béhar and Google. 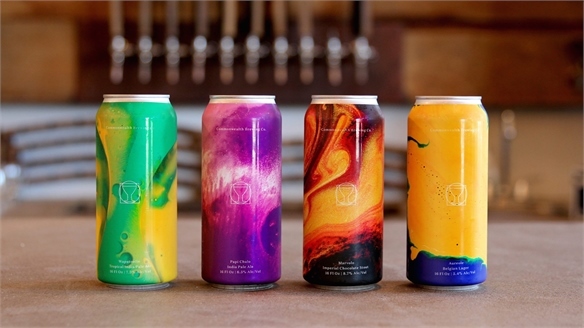 Visualising Flavour: Commonwealth Brewing Co. Visualising Flavour: Beer Packaging UK-based design studio Thirst has designed a range of packaging with a dynamic dye effect that expresses the flavour of beer through digital colour and pattern. The project was created for Virginia's Commonwealth Brewing Co.
Packaging Innovations 2017 Packaging Innovations 2017 Topical drivers including the crisis of ocean plastic, food waste and hard-to-win consumer trust led the conversation at Birmingham’s Packaging Innovations 2017. 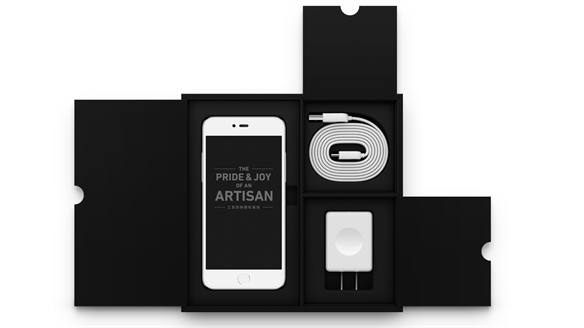 Mobile Phone Packaging Design: Subtle Reveal Mobile Phone Packaging Design The renowned iF Design Awards are regarded as the stamp of excellence within design. Here, we highlight three winners from the international competition's Packaging Category, which caught our eye with their streamlined and minimalist approach to consumer electronics packaging. 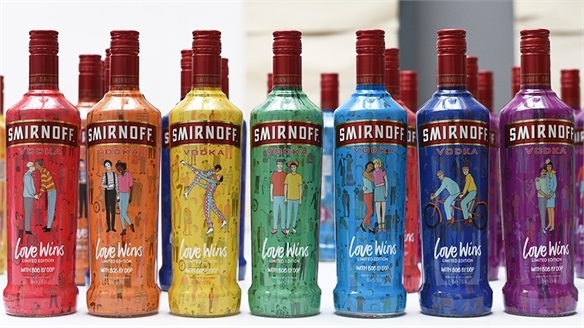 Key Takeaways: Packaging Innovations 2016 Packaging Innovations 2016 Packaging Innovations London 2016 took place from September 14-15 at Olympia in London, centring on innovative, creative and luxury packaging, and showcasing solutions from over 170 suppliers across a variety of sectors. 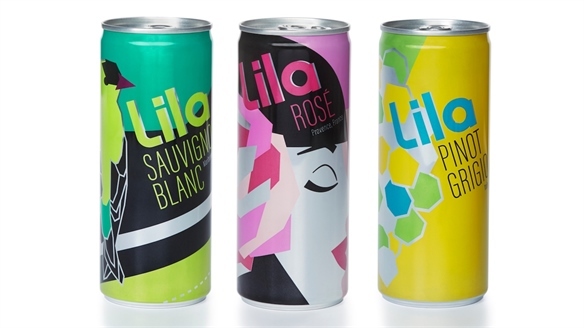 Millennial-Friendly Tactic: Wine in a Can Millennial-Friendly Wine in a Can As beer ventures into elevated wine territory – with the emergence of sophisticated pairing menus, for instance – wine is becoming more casual and approachable. Selling it in cans is one way in which brands are taking cues from the beer industry, targeting millennials with a format that aligns with their lifestyles and mindset. See also Gen Y: The New Wine Consumer. 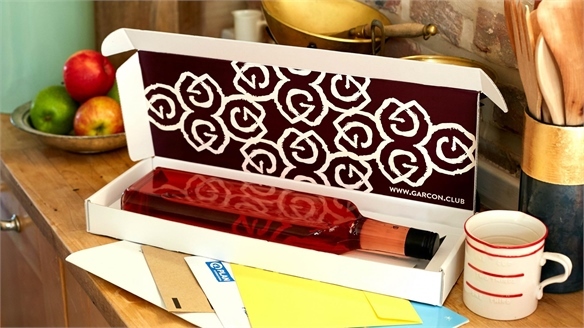 Luxury Packaging Trends 2016: Luxe Pack Monaco Luxury Packaging Trends 2016 The 2016 edition of Luxe Pack Monaco showcased a wealth of creativity and innovation. 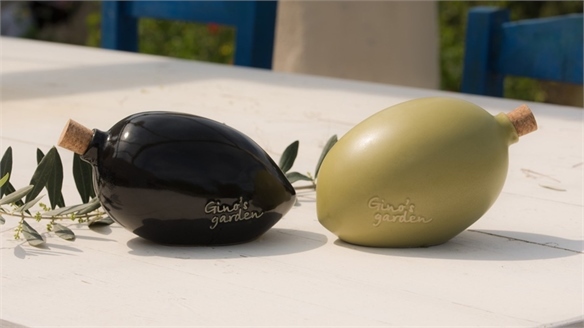 Exhibitors and speakers explored the power of emotion and surprise, tech-enabled reassurance and the potential of packaging for environmental good. 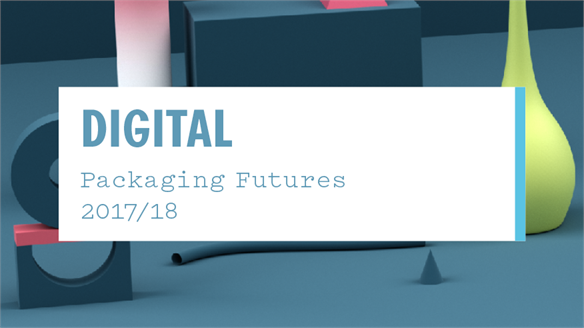 Stylus reveals the key innovations set to influence next-gen packaging.